Are you an outdoors enthusiast? An angler looking to keep his catch from getting spoiled? Or just someone who likes a nice chilled beer on a hot summer afternoon. You cannot go wrong with a rotomolded cooler. Rotomolded coolers are the best coolers in the world, and today we are looking at the best of the best rotomolded coolers you can buy. Note: The best rotomolded coolers for the money are all about performance. This means they tend to cost a bit more as well. If you are someone who’s not looking to spend too much on a cooler then check out our article on the best budget coolers. Few things in life compare to the pain of drinking a warm beer on a camping trip or coming home after a fishing weekend to find a cooler full of spoilt catch and melting ice (stepping on a lego comes close). If you would like to avoid this at all costs, then a rotomolded cooler is your only solution. Today we are going to look at some of the best-rotomolded coolers on the market. 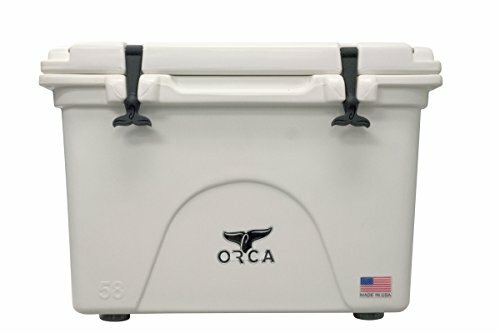 The Yeti dominates the entire rotomolded cooler market, so I’d be pretty surprised (and have mad respect for you) if you have heard of the Orca 58 QT before. But most cooler experts know the orca as one of the best coolers you could purchase. Cheaper coolers often have drains that stick up into the body of the cooler. This makes it really difficult to drain all the water unless you pick it upside down to get the last bit out. Orca coolers, on the other hand, have a really nice drain spout, This helps drains every bit of water from the cooler easily. It is also one of the most spacious coolers, you can use and will easily able to hold your beers with room for more. The latches you use to seal the lid shut are shaped like whale tails. The yeti tundra is the clear market leader for premium coolers, it is also the one to blame for the entire rotomolded cooler hype. So then is it any surprise that this cooler made our list? The Tundra is a tank, it can handle almost every kind of abuse you throw at it. Don’t believe us? Check out this dope video of a Yeti Coolers vs a 500lb man. The Tundra 45 is even certified as grizzly proof, this means in a fight between a bear and the Tundra 45. The Tundra wins. To achieve this degree of grizzly bear durability, they have invented a unique mechanism to lock and unlock the cooler. They do this with the help of a ball and latch mechanism. However all this durability comes at a price, the tundra weighs an insane 24 pounds even when empty. Another issue with all this extra padding is that tundra coolers have less space than other coolers of the same size. Important: As the cooler is in high demand, it is very likely to get stolen. Be sure to strap this cooler to the back of your jeep if you are going to be leaving it unguarded for a long time. In fact, you should even consider locking it down when not in use. We have discussed the best way you can lock your cooler below so be sure to check that out. Almost every test shows the Yeti coolers lasting for at least 5 days. It is an extremely durable cooler. Rotationally molded with 2 inches of high density closed-cell polyurethane insulation all round and is certified Bear-Resistant - so its vertually industructable and built to last! The Engel cooler is one of the most budget-friendly rotomolded coolers you can get. But just because it’s cheap does not mean it breaks easily. In fact, when tested for real-world conditions the Engel deep blue cooler was often one of the top coolers in terms of insulation. This mostly because of the rich 2-inch thick polyurethane insulation walls but also thanks to the seals used which are the same as those you find in freezers. This helps keep food fresh for much longer. However as Engel is still an up and coming brand, they are not able to compete with other big name brands like the yeti in certain things(like colors to choose from). 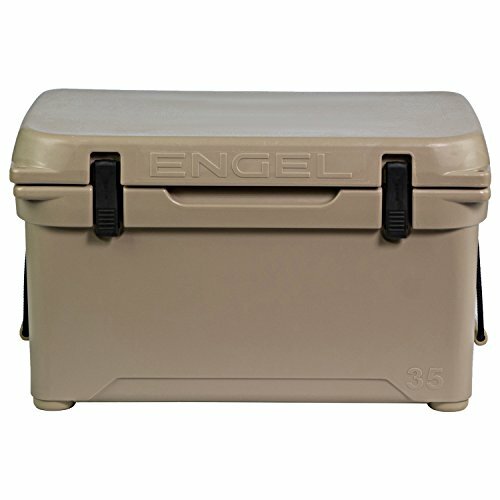 The Engel cooler comes in a ton of sizes, there’s even an oversized cooler with a capacity of a massive 320 quarts. 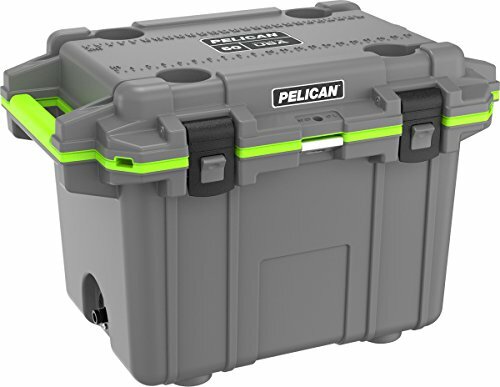 Most coolers generally come with a T-Latch system to open the cooler however the pelican coolers have a unique press and pull latch. This is something we have not seen in coolers from other brands. The manufacturer claims that this makes the coolers tougher to open for animals. In fact, Popular mechanics actually tested some of the most popular coolers against a grizzly bear attack and the Pelican IM Elite 45 was the only one capable of withstanding a grizzly attack. Another cool detail is that the manufactures actually took the care to ensure that the latches were wide enough to be even used with gloved hands. In terms of volume, you get a generous 40.7 quarts which is more than enough for 2 people over the weekend. You even get multiple handles(molded in handle and a sliding hinge handle) so you can carry your cooler the way you like. The pelican is extremely bulky for its size. Buying a cooler is mostly a practical decision. You want a durable cooler that will keep your stuff cool for a really long time. Every manufacturer promises weeks of ice retention and durability that’s head and shoulders above the rest. But is there any weight behind what they have to say? We are going to look at how these coolers actually perform in the real world and see if these manufacturer claims are they just hogwash. Popular Mechanics also performed a really interesting experiment where they tested coolers against a real grizzly bear. Although it’s been some time since the test was conducted, the entire experiment is really interesting and is worth a watch. Here are some things you should know before you make your cooler purchase. How many people will be using the cooler? What’s the quantity the cooler needs to support? For a day trip, you can go with a small cooler but longer outings will probably need something bigger. Also, consider that 30%-50% of your cooler capacity will be taken up by ice. Keep this in mind as you pick a cooler that’s right for you. If all of this is too much to think about, go with a 40-quart cooler. This should be enough for 3 people over the weekend. Remember that you will be carrying this cooler everywhere you go, so make sure it’s not too heavy. Which brings me to my next point. Let’s say you and your buddies are planning a five-day camping trip. You want to go all out and get a yeti tundra 110. 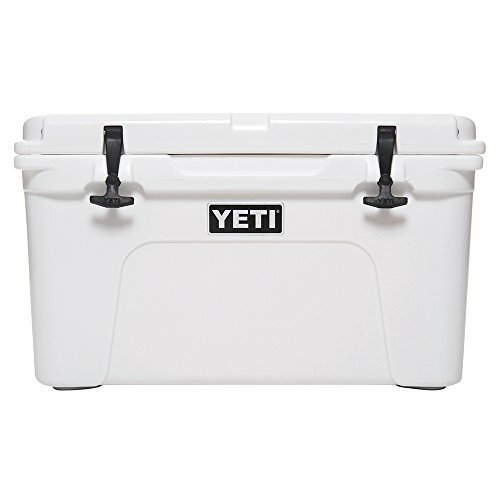 But consider this, a yeti tundra 110 when fully loaded with ice, drinks, and food can weigh up to 200 pounds!! This can be quite difficult to carry and you’re better off with 2 smaller coolers – one for drinks and one for food. There’s another advantage with this approach, as you are opening the food cooler a lot less than the drinks cooler. The ice in the food cooler will melt much slower and the food will stay fresh for longer. If you want to get the most ice retention from your coolers make sure to follow these tips. They will help you increase the ice retention and increase the performance of your cooler. Use ice to pre-chill the cooler the night before you use it. Although it’s tempting to keep checking if your food is getting warm. Hold yourself back. The less you open the lid the longer your food stays cool. If you cannot keep your cooler under a shade then just put a wet cloth on top of it. Another thing you want to remember is to keep the contents as compact as possible, the less air the better. However, this may not be possible if you are taking your cooler for fishing. Yeti coolers were born from the need for high-quality premium coolers people would be proud to own.To achieve this goal, the founders (Roy and Ryan Seiders) have created coolers that cannot possibly break. This dedication to quality has established Yeti as the leader in the cooler market. It is now the yardstick against which other coolers are measured. Orca coolers offer one of best warranties in the cooler market. The lifetime warranty is unmatched across almost all manufacturers. The cool thing about orca coolers is that every single one of them is manufactured right here in the U.SA. Different manufacturers have varying strategies for capturing the market. Some offer an extremely high-price to establish a premium brand while others pack a ton of features at a really low price point. Engel is the latter. They offer extremely high-quality and performance coolers at a competitive price. Engel often offers the same or even better performance than coolers that cost much more. But unlike the typical budget coolers, Engel coolers are pretty durable. You are not going to left with any broken hinges or lids with this one. In fact, Engel was the first company to offer the rotomolded cooler. While you can get a regular cooler for under $20 at Walmart. Rotomolded coolers generally cost up to $200. What’s so special about them? A rotomolded cooler is made from a process called rotation molding (explained below). This process creates coolers without any imperfections, these kinds of coolers are much better at keeping things cold. How are Rotomolded Coolers made? Roto-molded coolers are made from a special process called roto-molding. It works by first placing a powdered plastic poly-material into a heated mold. This mold is then rotated( hence the name) until the plastic completely melts. Are rotomolded coolers any better? Comparing a rotomolded cooler with a regular one is like comparing an F1 car with a Honda. Rotomolded coolers blow out regular coolers in terms of ice retention and durability. While a regular cooler can keep your ice cold for a day or 2. Rotomolded coolers have an ice retention of over a week. That’s 500% more than a regular cooler. This is because of the quality of insulation used. Rotomolded coolers use freezer grade rubber gasket while regular coolers come with no seal to keep the heat out. Even the insulation is much thicker(2 inches on average). Because rotomolded coolers focus on durability they feel very different compared to regular coolers. In fact, most rotomolded coolers come with at least a 5-year warranty while regular coolers hardly last more than a year. While a rotomolded coolers cost a lot more than your average cooler, they are worth every penny. One important factor to recognize is that having this type of cooler for your outdoor activities will save you time and money in the long run. How to lock down your cooler? You’ve spent a lot of money on a brand new cooler. Let’s keep it safe. Coolers are one of the most commonly stolen items during camping trips. You should lock your cooler down if you are going to leave it unguarded for some time. Although most coolers can be safely secured with a simple padlock, you should go for a chain lock as a safer option. For extremely paranoid people(like me) a deny lock is a great option. 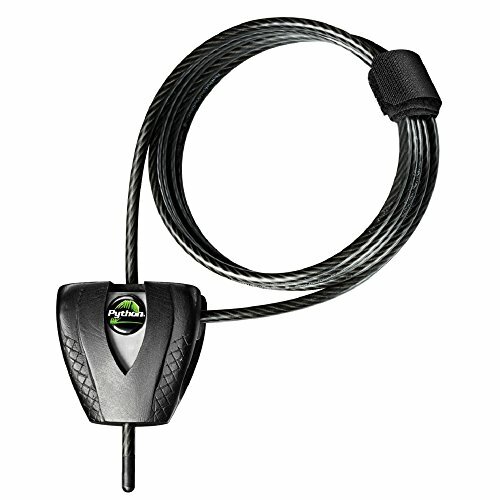 In fact, the Python Keyed cable lock is one of our favorite cooler locks. It’s cheap. It’s durable and it works. Do larger coolers retain ice for longer? A very common misconception is that larger coolers retain ice longer. Although this is kinda true, the size doesn’t play a huge impact. Pre-chilling a cooler often plays a bigger role to ice retention than the size. If you are going on a camping trip you want your cooler to work as expected(especially after you spend a ton of money on it). This is why the Yeti Tundra 45 has to be the go-to option for us, not only is it extremely durable but they also have a ton of accessories. Yeti already has a great reputation for creating reliable coolers and is a brand we can trust. On the other hand, the Engel is a great option to go for if you are looking to get the most bang for your buck.